Rebound Rumble is played by two competing alliances on a flat, 27 x 54 ft field. Each alliance consists of three robots. They compete to score as many basketballs into their hoops as they can during a 2 minute and 15 second match. The higher the hoop in which the basketball is scored, the more points the alliance receives. 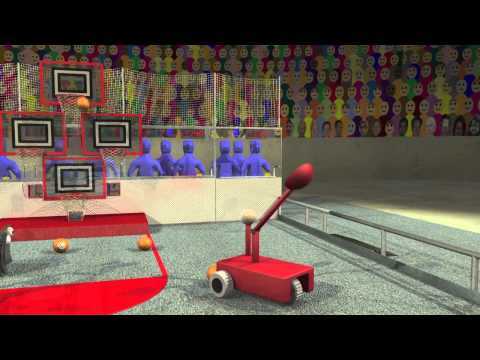 The match begins with a 15-second Hybrid Period in which robots operate independently of driver inputs. During this Hybrid Period, one robot on each alliance may be controlled using a Microsoft Kinect. Baskets scored during this period are worth 3 extra points. For the remainder of the match, drivers control robots and try to maximize their alliance score by scoring as many baskets as possible. Baskets are worth 3, 2, or 1 point in the top, middle, and low hoops, respectively. The match ends with robots attempting to balance on bridges located at the middle of the field. In Qualification Matches, a robot from each alliance will also try to balance on the white CoopertitionTM bridge to score additional ranking points for each alliance. Scoring for the match is summarized below. One robot balanced is worth 10 points, two is worth 20 points, and three is worth 40 points (only in elimination matches). Simbotics, Team 1114 entered Greater Toronto West Regional as our final regional for the 2012 season. After two regional wins, Simbotics were hoping to claim a third. Simbot Jordan had a successful Friday filled with eventful matches, coming out with a record of 6-1 and 10 co-opertition Points. Our team was also awarded with our third website award of the season. Congratulations to our website team for this tremendous achievement! Team 1114, Simbotics. entered the 2012 Waterloo Regional with our robot Simbot Jordan looking to build on the success found at the Greater Toronto East Regional. After Friday’s matches, we were in second place with a 7-2 record and a 26 Qualification Score. On Friday we were also recognized by winning our second Website award of the season. Team 1114 began our 2012 season at the Greater Toronto East Regional, where Simbot Jordan was unveiled. Simbotics had a very successful first day, going 6-1 in Friday’s qualifying matches, and ending the day with the regional Website award.